Released in the UK on 24 June 2013. Released in the USA on 6 August 2013. All tracks are performed by Kerry Ellis (vocals), Brian May (acoustic guitar) and Jeff Leach (keyboards) except where noted. Special thanks to Anita Dobson, James Townsend and our families, and to our faithful fans. Always appreciated. The album was recorded at various venues on the 2012 'Born Free' tour of England. It features 4 Queen tracks, 3 tracks from Kerry's debut album 'Anthems', 7 cover versions, and 1 new track written by Brian and Kerry. Brian plays acoustic guitar on 12 tracks, electric guitar on 2 tracks, and one is performed by Kerry and Jeff Leach with no involvement from Brian. The album was later included as part of 'The Candlelight Concerts - Live At Montreux 2013' DVD and Blu-ray releases in 2014. Track 1. Track length 3:19, song length 3:00. Performed by Brian and Kerry, with Stuart Morley on keyboards. Recorded at the City Hall, Salisbury, England, on 17 November 2012. Details of this cover version can be found on the 'Golden Days' album page. Track 2. Track length 4:49, song length 3:19. Recorded at the Union Chapel, London, England, on 11 November 2012. Details of the original version can be found on the 'Anthems' album page. Brian: Thank you very much, and I would like to introduce you to the incomparable Kerry Ellis. This gig, this tour, is all about Born Free as you know, which is all about trying to change the way that we treat animals, and in particular it's supporting the work of Born Free in Africa to try and save the lion, um, very happy to say I believe Virginia McKenna is with us, um, very honoured to have you with us. Our first little animal for you is a very small one, and er, but it's kind of a metaphorical animal because this is about some things that are glittering actually being gold, so um, this is, sometimes we call it 'Butterfly'. Brian: Thank you very much. Track 3. Track length 3:44, song length 3:00. Recorded at The Apex, Bury St Edmunds, England, on 5 November 2012. Track 4. Track length 4:21, song length 3:41. Recorded at the Corby Cube, Corby, England, on 7 November 2012. Details of this cover version can be found on the Live Only Songs page. Track 5. Track length 4:25, song length 3:09. Recorded at the Alban Arena, St Albans, England, on 12 November 2012. Details of the original version can be found on the 'Golden Days' album page. Brian: 'Oh dear' she says. Right, we're gonna take a little risk now, because we haven't really done this song very much, um, it's new, we, we wrote it a couple of days ago. (Applause). Yeah, yeah, I mean we, yeah. Track 6. Track length 4:55, song length 3:37. Performed by Kerry, with Brian on electric guitar. Brian: This is the guitar that came with us into the jungle, I thought it would be a good idea because it wouldn't be affected by the damp, because it's kind of metal, but it has a very kind of mournful sound and I've become very attached to it, and this is a song which we actually sang in the jungle because it was written by Virginia McKenna herself, the founder of Born Free, she wrote this beautiful little song about thirty years ago, and it never really saw the light of day, when we all met up she said 'it would be fantastic if Kerry would sing it, can you do an arrangement to make that happen' so we set about it, and we actually surprised her in the middle of the jungle one night around the campfire and sang it to her, which I think is on film, so you may see that one day, and the song is 'Nothing Really Has Changed', and we're gonna show you a little bit of footage which will perhaps make you think a little bit about wild animals, not just wild animals in Africa, but wild animals right here, around us. Do you want to add anything? Track 7. Track length 4:30, song length 3:49. Details of the original version can be found on the 'Hot Space' album page. Track 8. Track length 3:43, song length 3:00. 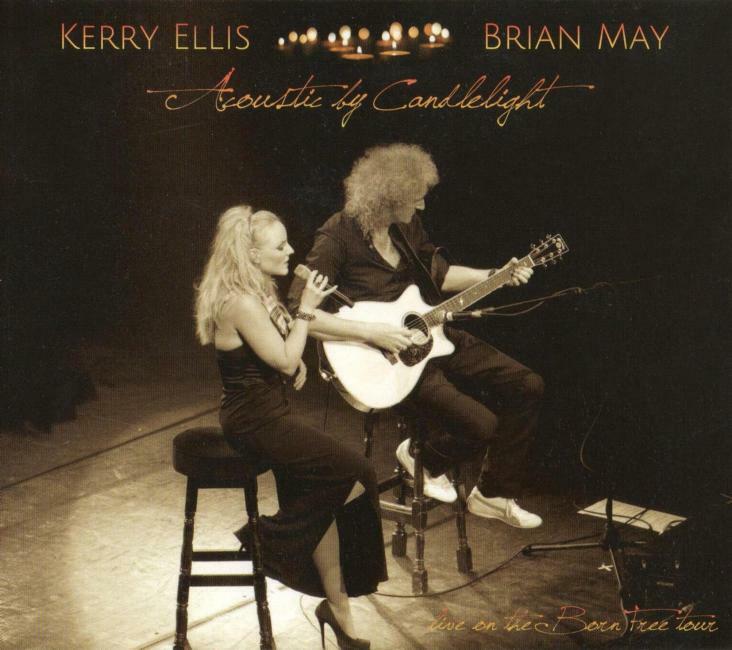 Kerry later recorded this track for her solo album 'Kerry Ellis', with Brian on guitar, and details can be found on the 'Anthems' songs page. Track 9. Track length 4:32, song length 3:36. Track 10. Track length 4:37, song length 4:11. Recorded at The Assembly Halls, Leamington Spa, England, on 6 November 2012. Track 11. Track length 3:25, song length 2:44. Performed by Kerry and Jeff Leach, without Brian. Kerry: So, I was in Wicked. Ha, ha, ha. Um, I was very fortunate to play it in London and on Broadway, and I had an amazing time, and loved it. When Brian first came to see me play Elphaba, he, ah, he fell in love with the song that people kind of, it passes them by, and they kind of miss it the first time round, and it was the first song we went on to record, and went on to 'Wicked In Rock'. This is 'I'm Not That Girl'. Track 12. Track length 4:32, song length 4:02. Track 13. Track length 3:44, song length 3:07. What can I give him, small as I am? Track 14. Track length 3:47, song length 3:24. Details of the original version can be found on the 'The Game' album page. Track 15. Track length 6:04, song length 5:25.